We can never fully comprehend what it meant for the transcendent and infinite Creator God to become finite man. Yet Jesus, who was “so much better than the angels” (Hebrews 1:4), willingly set aside certain features of His deity and “made Himself of no reputation, taking the form of a bondservant” to come “in the likeness of men” (Philippians 2:7). Even more, the King of heaven gave up His authority, power, and glory, and took on “the likeness of sinful flesh” (Romans 8:3) and “became obedient to the point of death, even the death of the cross” (Philippians 2:8). In this way, God graciously showed His great love for us by giving “His Son to be the propitiation for our sins” (1 John 4:10). This perfect gift is the reason we celebrate Christ’s birth on Christmas Day. 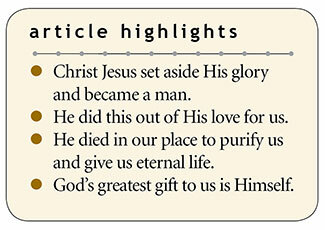 Its profound significance was best summarized by Jesus Himself: “For God so loved the world that He gave His only begotten Son, that whoever believes in Him should not perish but have everlasting life” (John 3:16). This is arguably the best-known, most-loved, and greatest of all Bible verses, and it has drawn countless people to put their trust in Christ for salvation. The greatest of all gifts was when God gave Himself for a lost and undeserving world. Giving is a very prominent theme in the Bible, with such words as “give,” “gift,” “gave,” etc., appearing more than 2,000 times. The first occurrence is in Genesis 1:17, when on the fourth day of creation God created the sun, moon, and stars “to give light on the earth.” The last is Revelation 22:12, when Christ will return with His rewards “to give to every one according to his work.” Clearly, though, the greatest of all gifts was when God gave Himself for a lost and undeserving world—because it met the greatest need, revealed the greatest love, and fulfilled the greatest purpose of any gift that could possibly be conceived in the heart of God. Such a gift from God is abundantly sufficient to provide salvation and eternal life for the whole world. But a gift only becomes a gift when it is accepted. And the greatest of all tragedies is to see this greatest of all gifts ridiculed and scorned, or simply ignored, by the vast multitudes who need it so desperately. When the world refuses the perfect gift of Christ Jesus, they are turning down the source of all love, life, and truth—and the end result can only be everlasting death. God did all He could do when He gave His Son to suffer and die in our stead. What joy is ours to accept it, knowing we will spend eternity in heaven with Him! For these reasons, it is fitting that we give gifts at Christmastime to emulate God’s first and most perfect Christmas Gift to us. ICR is grateful to all those who follow this example, thanking God daily for those who uphold our ministry with their gifts of prayer and finances. As Acts & Facts has shown this year, the ICR ministry is moving into new areas with enormous potential to reach many more people, and your generous tax-deductible gift this season will be a great blessing to us as we make plans for the coming year. If you are able, please prayerfully consider how you can help. We promise to apply it carefully to our work to proclaim and glorify our Creator, the Lord Jesus Christ. From all of us at ICR, may God richly bless you and your family this season as we celebrate the birth of our Savior—God’s greatest gift to us. Merry Christmas! Cite this article: Henry M. Morris IV. 2018. God's Greatest Gift. Acts & Facts. 47 (12).